Earthquake Recovery Our last letter was written a week before the horrific 7.0 quake on January 12,, 2010 which destroyed much of Port-au-Prince and surrounding towns. The Salvation Army property in PAP on Delmas 2 was severely damaged and is now in the process of being reconstructed. A team was put together to oversee the reconstruction and development. My brother and sister-in-law, Majors Bob and Rae were assigned as part of the team so we have had the added blessing to have family living here in Haiti since September, 2010. Much progress has been made in rebuilding and repairing school and housing and now the foundations have been laid for the PAP compound which includes a big primary, secondary school and PAP Central Corps (church) which has a congregation of about 1,000 members. General Linda Bond was just here and was able to tour the construction site. Projects at Bethel During 2012 there were several projects that we were able to complete. We have been trying to replace the 2000 Toyota Land Cruiser that is the work horse of the clinic. The USA Central Territory along with some dear friends contributed funds so that a new Land Cruiser could be purchased and outfitted. It was released from customs in February and is now serving the clinic well, carrying purchased meds and supplies from Port-au-Prince, making it possible for clinic staff to visit throughout the zone and to transport patients in need of more extensive medical care to nearby hospitals. Another project close to completion is the equipping of an operating room, thanks to a gift from the Clearwater, FL corps. This will greatly improve our ability to assist mothers in difficult deliveries. Our partnership with Catholic Relief Services (CRS) helped us secure funds to ceramic the entire clinic. Visitors have commented on how bright and clean the clinic looks with the new tiles. Our expanded AIDS program entered into its ninth year in 2012. The funding was smoothly transitioned from the AIDS Relief partnership (headed by CRS) to Catholic Medical Missions Board (CMMB). We have nearly 900 patients on ART and another 200 on palliative care. Counseling and home-based care is given along with full medical care. This is through a PEPFAR grant funded by the US government begun under President George W. Bush in 2004. Transition from life at Bethel Clinic In the middle of a planning meeting in April on the future expansion of the clinic, we received a call from the Divisional Commander. We were told that we were under farewell orders and would be transferring to Trinidad & Tobago as of July 12, 2012. While we have been serving at Bethel for 10 &frac12; years, the call was a bit of a surprise. Felix has been appointed as the Divisional Secretary and the corps officer at Tragarete Road Corps and Violet will be the Divisional Secretary for Women’s Programs and the director of the Josephine Shaw House, a hostel for young working women. The next few months included wrapping up many projects that were in the works while we submitted our documents to Trinidad for our work permits. Felix was able to share a transitional period with the incoming administrators, Majors Minel and Deniese until the end of August. When we left Fond-des-Negres at the end of August, Bob and Rae extended their hospitality to us and we moved to their home in Port-au-Prince while we waited for our visas and work permits to be approved. We are very grateful for their hospitality and the opportunity for family time. The governmental approval is a very long process and we are still waiting for the word that we can move on to Trinidad. As we were expecting to travel to Trinidad in early September, Matthew was not put into school in Port-au-Prince. 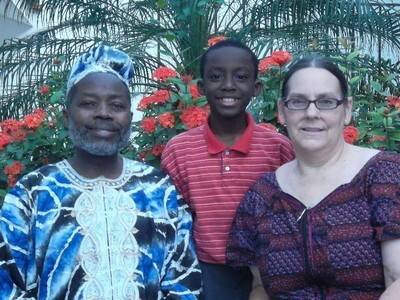 Instead, he is being home schooled with an emphasis on reading and writing in English and mathematics. He is making good progress and I haven’t lost my sanity so I guess things are good. It has been a blessing to spend this time together as a family, in devotions, in study and parental interaction. August Visit to the US In August, Violet and Matthew were able to take “homeland furlough” to the States to visit family. During the visit the family gathered in NC at The Salvation Army Camp Walter Johnson to celebrate the 60 years of marriage of Gordon and Ruth. All five siblings and their spouses were able to come as well as four of the grandchildren and two of the great grandchildren. It was a great time together renewing relationships and having fun. Hurricanes Hurricanes are part of life for those of us living in the Caribbean. Since the earthquake, when thousands were living in tents with nowhere to go to escape the weather, Haiti was spared with no major hurricanes making landfall in 2010 or 2011. This year there was heavy rain and wind from both Hurricane Isaac in August and Hurricane Sandy in October. Flooding is always dangerous with riverbeds that are usually empty becoming raging rivers racing to the sea. With 54 lives lost, over 1,300 homes destroyed or swept into rivers and great damage to crops, life continues to be difficult for thousands. We are grateful that it wasn’t a direct hit. 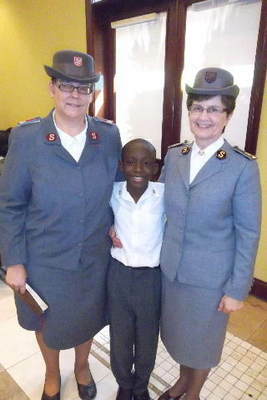 General Linda Bond in Haiti One major blessing from not having gone on to Trinidad was being able to participate in General Bond’s visit to Haiti, November 14th. 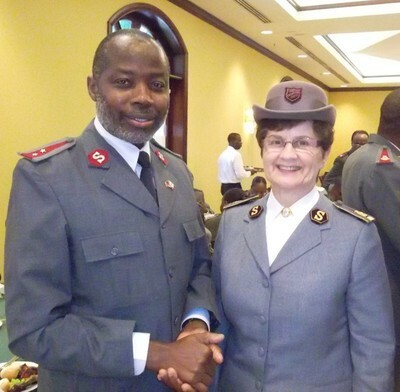 She conducted a Soldiers’ Rally on Wednesday morning with a crowd of over 1,000 Salvationists. There was an enrollment of over 20 Junior Soldiers and 50 Senior Soldiers, 20 of which are from a new outpost started at the new DHQ location in Santo 6. After the Soldiers’ Rally the officers were invited to have lunch with the General and the THQ/DHQ staff. That was a wonderful privilege! We were able to greet her personally and have our pictures taken with her. This is the second general Matthew has had his picture taken with, the first being Gen. Clifton November, 2009 only six weeks before the earthquake. The new year promises to be filled with new experiences as we adjust to our new assignments and new home in Trinidad and Tobago. Looking forward to having you come down for a visit. MAY GOD GRANT YOU A VERY BLESSED NEW YEAR! That we have finished eleven blessed years of service at Bethel Clinic and have handed over the work to the new Majors, capable Haitian officers. That the clinic now has a new Toyota truck to support the ministry there. That the financial system of the clinic was able to be computerized, with the wonderful help of Major Sandy. That a new operating room has been set up to give a modern facility to do minor surgeries and emergency delivery interventions. That God provided a place for us to live while we are waiting to move to Trinidad. That God has been ministering to us and through us during this time of waiting and that He has been putting people in our path that need the encouragement that we can give. That Matthew is making progress in his learning as we work with him at home. That we will be able to find flights to get us to Trinidad without undue delay once the permits are approved. That we will learn our new responsibilities quickly so as to be able to pick up the load that has been being carried by the Divisional staff for five months in our absence. That Matthew will be able to fit into the new English-based school system without difficulty and make new friends easily. For a smooth transition at Bethel Clinic with the new administration and the staff who have served with us these past eleven years.